Hello friends! 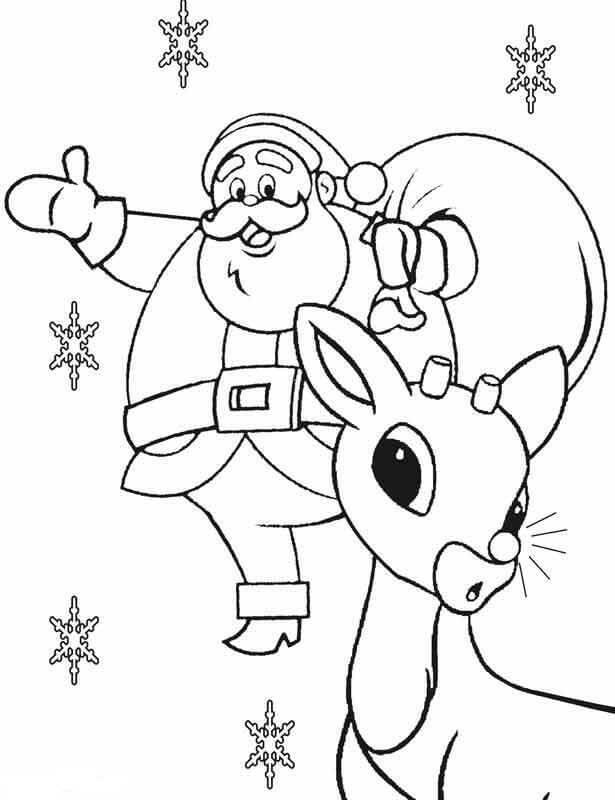 Today we’ve got you, Rudolph, the Red Nosed Reindeer coloring sheets to print. Rudolph, the red-nosed reindeer, and Robert Lewis May are two names synonymous with Christmas. Well, for the record Robert Lewis May is the creator of this famous Christmas carol. Rudolph is popularly called ‘Santa’s ninth Reindeer’. 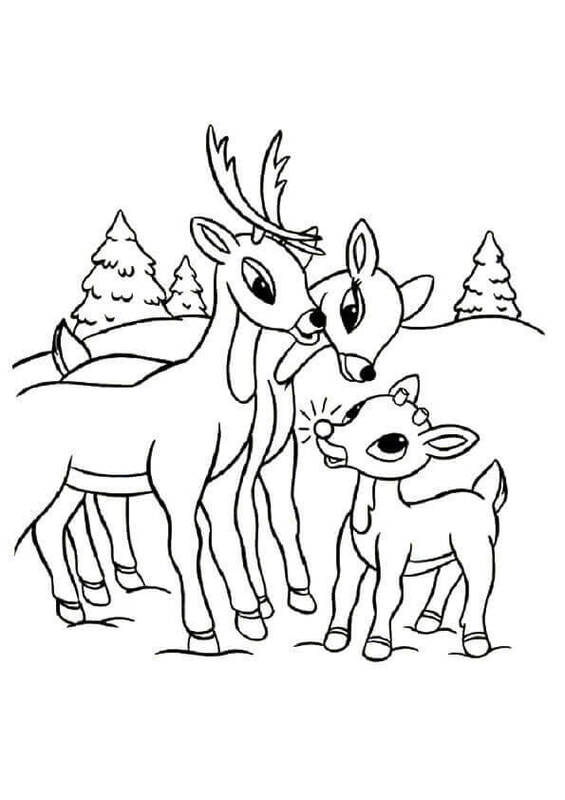 This red-nosed cute animal is in his adolescence with a few young antlers and a glowing bright red nose. He first made his debut in a booklet published by Montgomery Ward and written by Robert L. May. Owing to his popularity, songwriter, Johnny Marks, decided to turn this creature’s story into a song. The song was released on September 1, 1949. Even though Rudolph was scrutinized for his red nose, the sheer gleam of it is supposed the light the tough and harsh wintery path, guiding the entire team to distribute happiness safely. 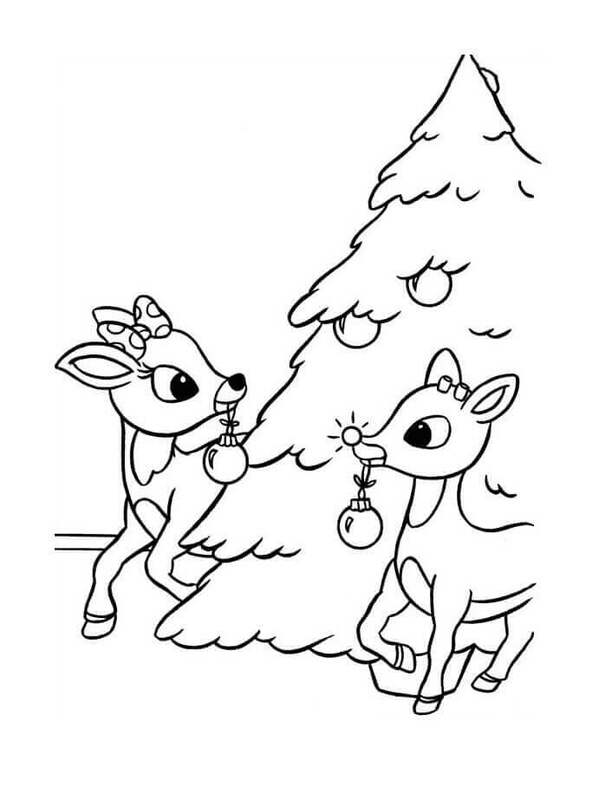 Let us pick up some colors and sing our way through these free printable Rudolph the Red Nosed Reindeer coloring pages. Bumble is a snow monster and an abominable one! Well not really. He is just an irritated, big white bear. I bet you cannot guess the reason for his irritation! It is just a toothache. And when he roars, he is actually moaning his pain. Let us get this huggable creature a dentist and begin coloring him all white. 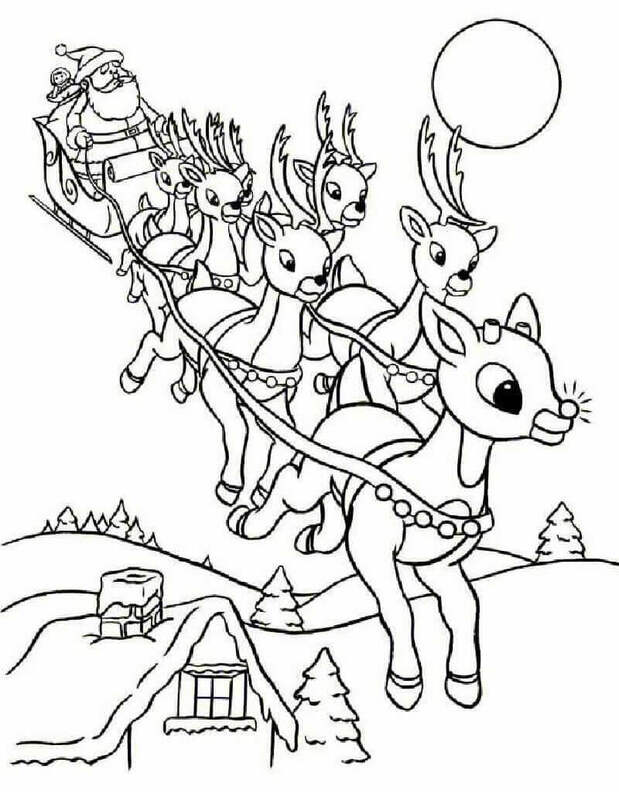 Rudolph, as we all know, is the leader of Santa Claus’ wagon. He leads all the other reindeers! Quite an important job if you ask me. And you know what the perfect leader needs to guide his tribe? A whistle! Just like in the picture. Looks like Rudolph is mentoring some young new recruits. Let us give him a hat and get those new recruits going. 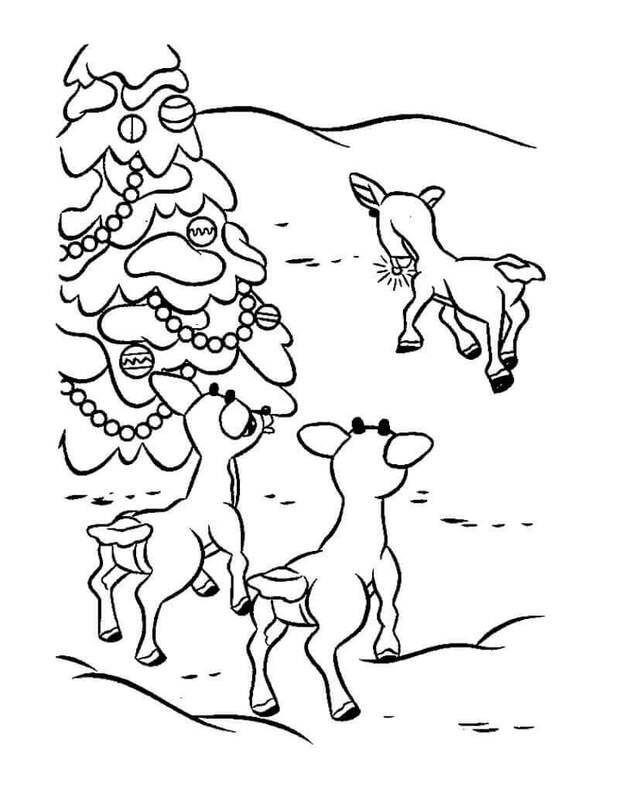 Color this picture but don’t forget the decorations on the tree. 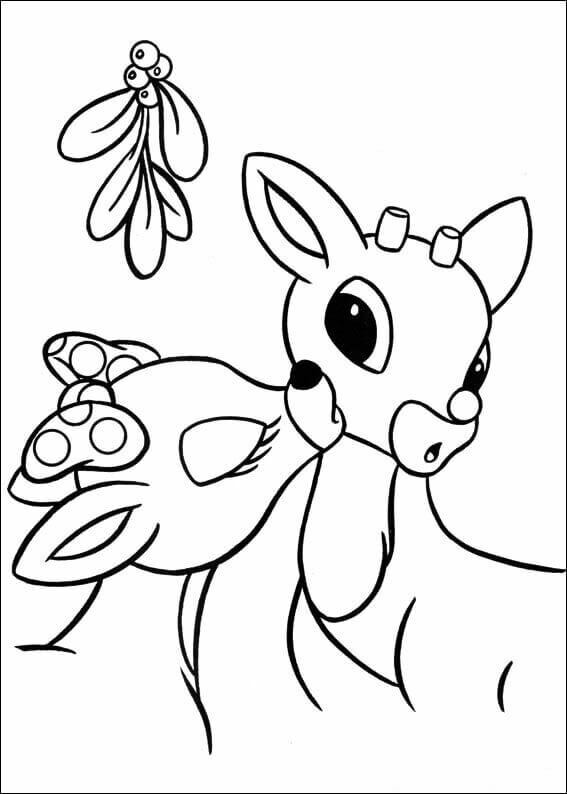 Rudolph and Clarice, a love story to remember and cherish. These two were the childhood best friends who later became the sweet couple we all know. They first met at the Reindeer Games. 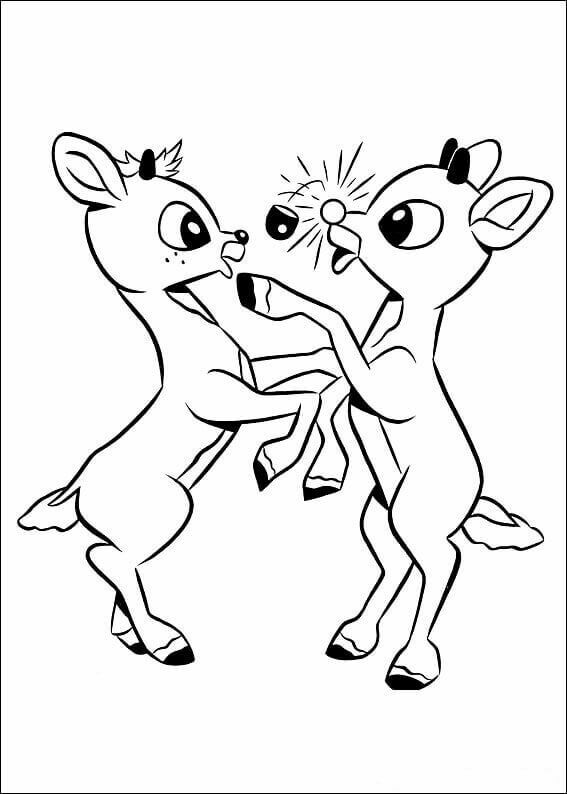 Their matchmaker is another reindeer named Fireball, who encourages both of them to talk to each other. Sometimes all it takes is a little courage. Let us color this love story beautifully. Ever wondered from where does Santa get all those gifts for you? Well, there is a fabled factory on the North Pole. It is a magical place full of magical creatures. The prime among them being the elves, master workers of Santa’s factory. These mystic beings can work day and night with unwavering stamina and efficient creativity to produce gits to the tiniest of your favorite details. Let us pay them some respect by coloring them their favorite green color. 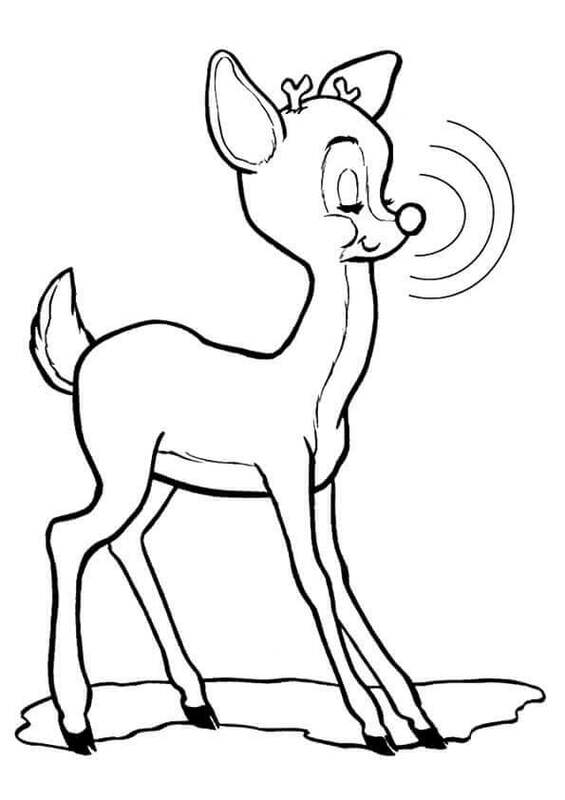 Fireball is another reindeer who took part in the Reindeer Games. He makes friends out of both Rudolph and a doe named Clarice. Fireball turns out to be their matchmaker. He and Rudolph then have a playful tussle in the snow. And at that precise moment, Rudolph’s fake nose falls off, revealing his true bright red glowing nose. 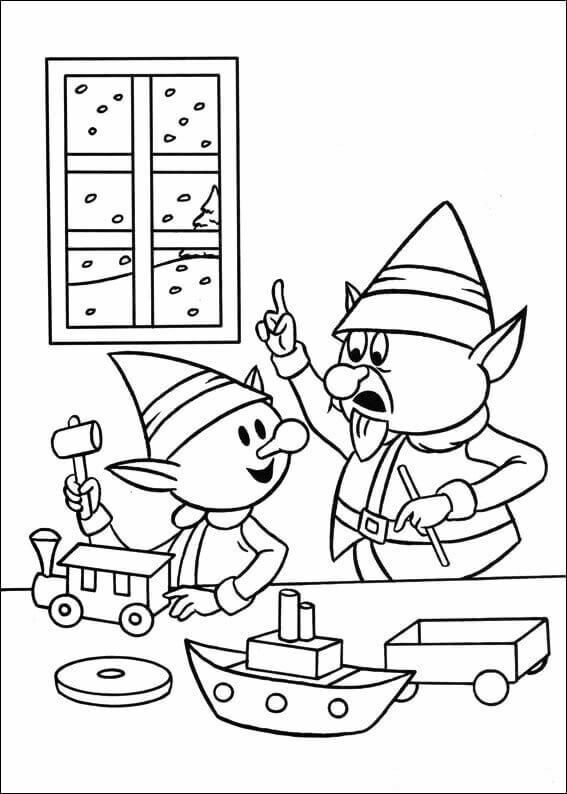 Let us color this funny incident and have some fun in the snow this winter. Hermit is an elf. But not an ordinary one. He is one of those elves who doesn’t want to follow the path already decided for him. He wants to deviate and pursue his dream. He wants to become a dentist and not a toy maker. 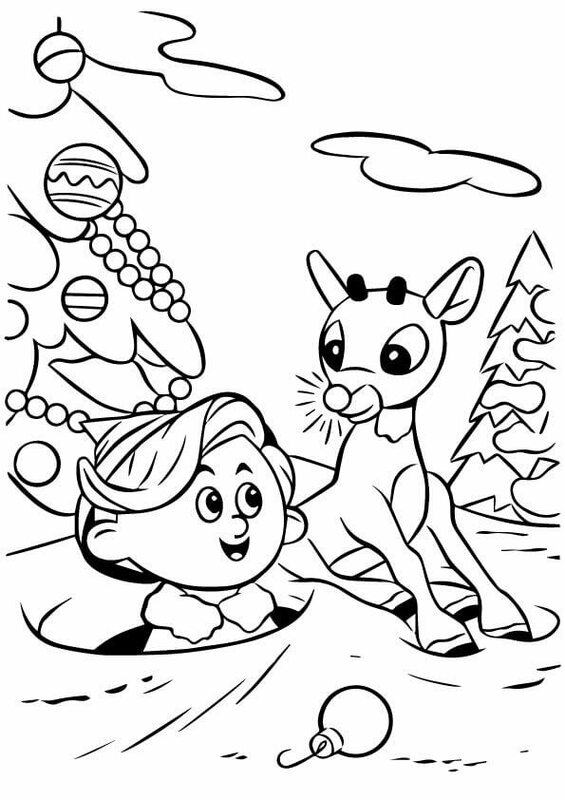 After a lot of struggle, in which Rudolph supports him, he finally wins the approval of everyone he loves and he opens up a dentistry clinic of his own. Color this image with a passion for your own dream. Rudolph was a young buck. A cheerful one at that and the youngest in Santa’s troop. A lot of responsibility on the small shoulders but surprisingly Rudolph manages everything wonderfully well. Let us color him with a happy face. 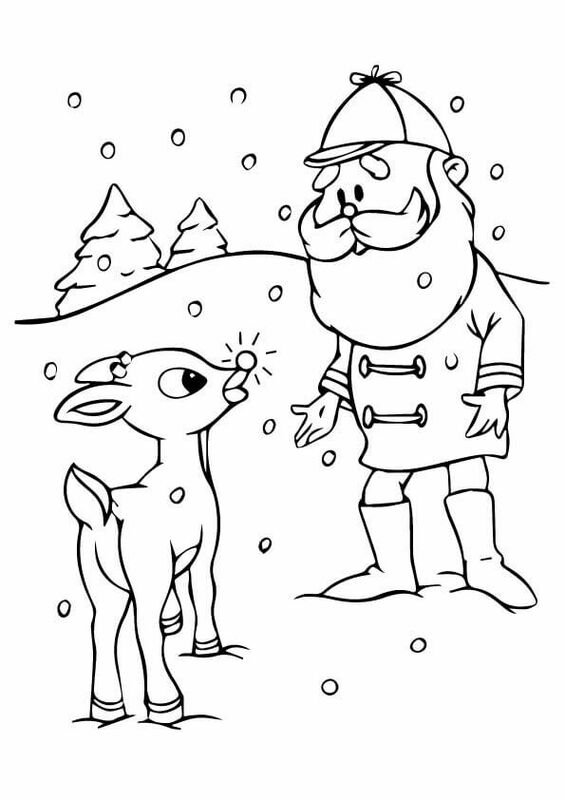 It was in two-thousand and fourteen that Rudolph the red nosed reindeer celebrated his seventy-fifth anniversary. On December 6, 2014, the US Postal Service decided to give away a range of Red-Nosed stamps displaying some of the latest characters like Bumble, Santa, and obviously Rudolph. 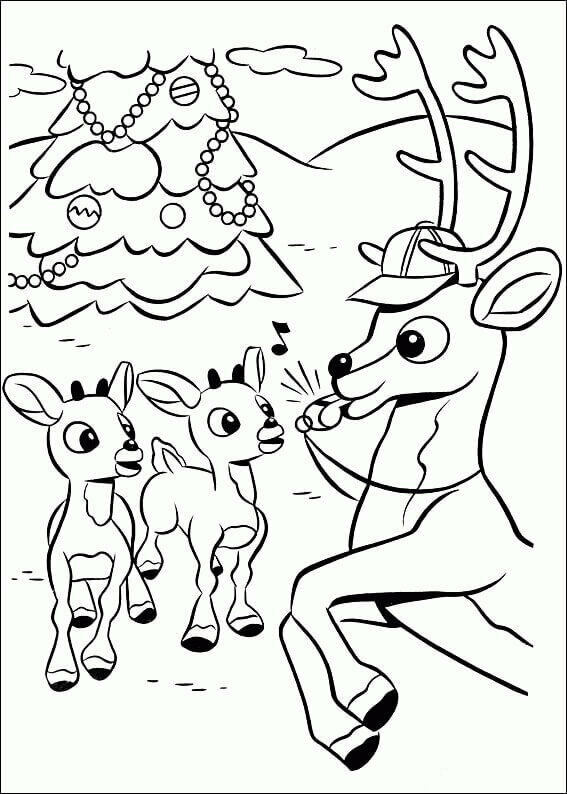 Let us color this red-nosed reindeer amidst the white snow heading for a race. Hermey became a misfit. He was considered to be a social outcast. The other elves boycotted him because he dared to dream different from them and different from what was already laid down and decided for him. All because he wanted to become a dentist instead of a worker manufacturing toys. The best part is, in the end, he did achieve his dream. Let us celebrate this dream seeker by coloring him well. Hermey and Rudolph were a bunch of misfits. Hermey because of his dreams of becoming a dentist and Rudolph because of his red nose. They were shunned and rejected by society. They weren’t valued for what they had and stood for. In the face of all these difficulties, these two confronted the world in front of them and eventually they were celebrated by the very society that didn’t accept them. 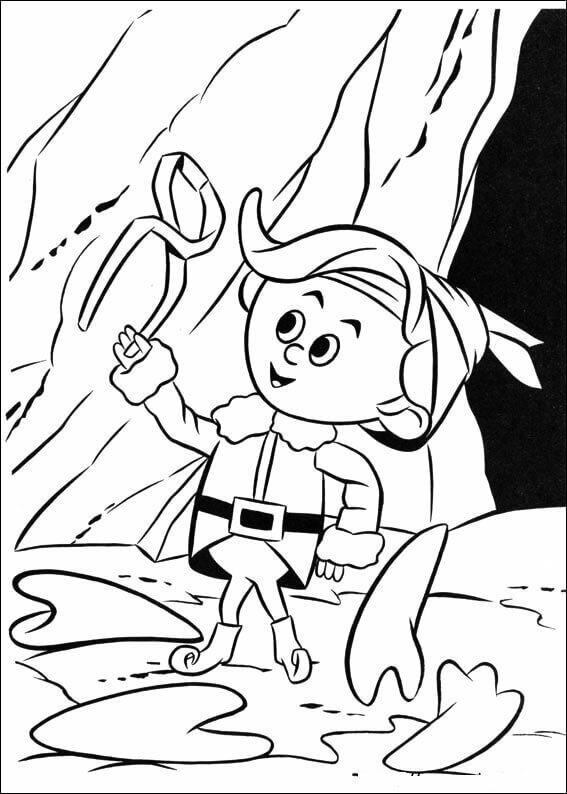 Let us color this tale of courage and believing in ourselves. King Moonracer is the supreme king of the “Island of Misfit Toys”. He is an amalgamation of a lion and a bird just like, Griffin, the mythical creature. 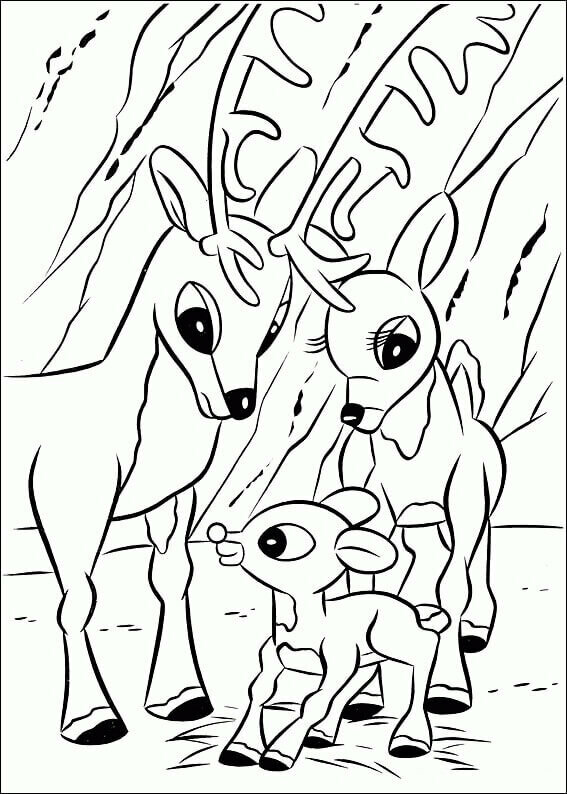 When Rudolph and Hermey seek shelter in the Island of Misfits Toys, they are denied, but the King asks them for their help to help allay their situation. He wants them to explain to Santa the fact that a toy is loved truly only in the hands of a child. On agreeing, Rudolph and Hermey get a place to stay for the night. 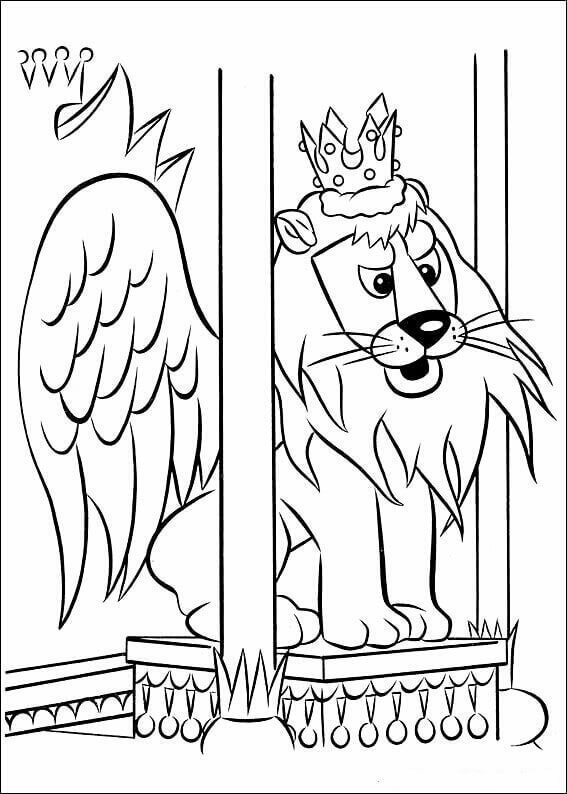 Let us color this King. Rudolph and Hermey went through quite a lot together. Even when shunned by society, they gave each other the support they needed and faced their struggles together. Let us color this couple of best friends and celebrate the amazing people that we have met and will meet in our lives. Happiness is when everything works out in the end. That is the beauty of life. If you follow your heart and you do it with passion, in the end, you will always get what you want. Rudolph, seen as a misfit, as a social outcast, in the end, proved his mettle and his worth. He became indispensable for Santa’s troop. Hurray! Is the ending we are looking for. Color this page well. This beautiful pair of Rudolph and Clarice met in the Reindeer Games. Love is pure. Rudolph has experienced it. Look at this happy couple decorating a beautiful Christmas tree. While coloring this image, visualize how you want the love of your life to be. And one day, through the powers of the universe you shall receive what you wish for. Rudolph met many on his journey to find his purpose. Seals are common in Christmasland. The best part is they are incredibly friendly. 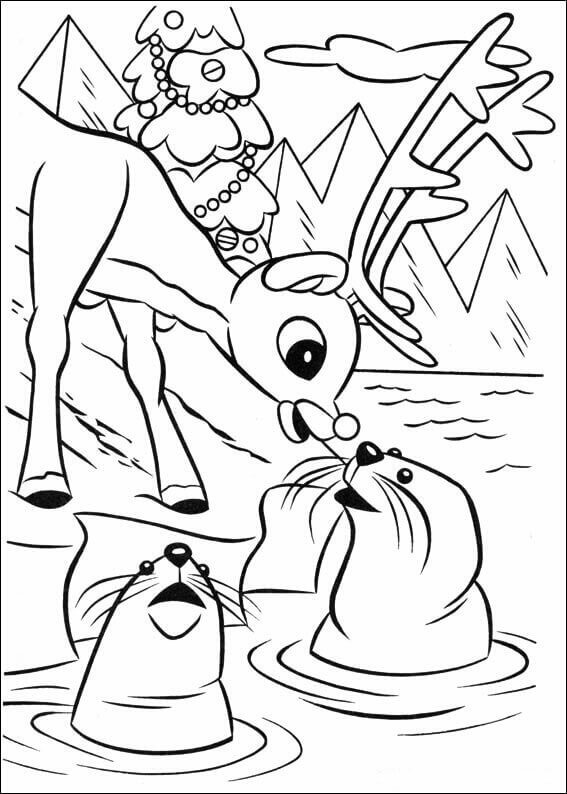 Get some grey shades out and color these happy seals, joyfully playing with Rudolph. Don’t forget to invite your friends to help you have some color in your life as well. Over the years, many versions of “Rudolph, The Red-Nosed Reindeer” has been created. Perhaps the best among them is by Rankin-Bass stop-motion animation. It was created in 1964, run on NBC, but its recording was done completely in Japan. Interestingly, the soundtracks and the voices of the characters were from Canada. 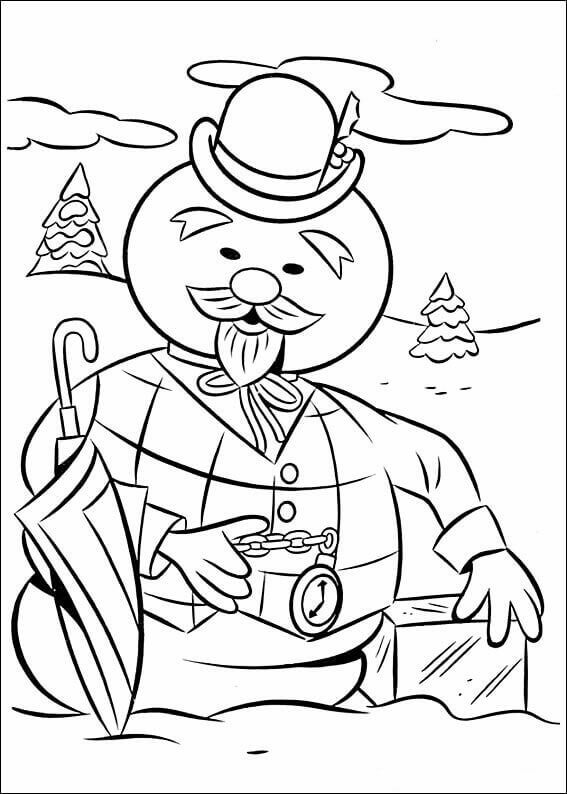 Let us color this celebrated character. Rudolph, as we all know by now, had an incredibly bright red nose. It was often condemned because it felt like the reindeer was intoxicated with liquor. However, it served an incredibly important purpose. It was to guide Santa and the troop of his reindeers in the dense cover of snow. He lit the way to make sure that the hard work of the elves was delivered to you in the form of pure and unadulterated love. 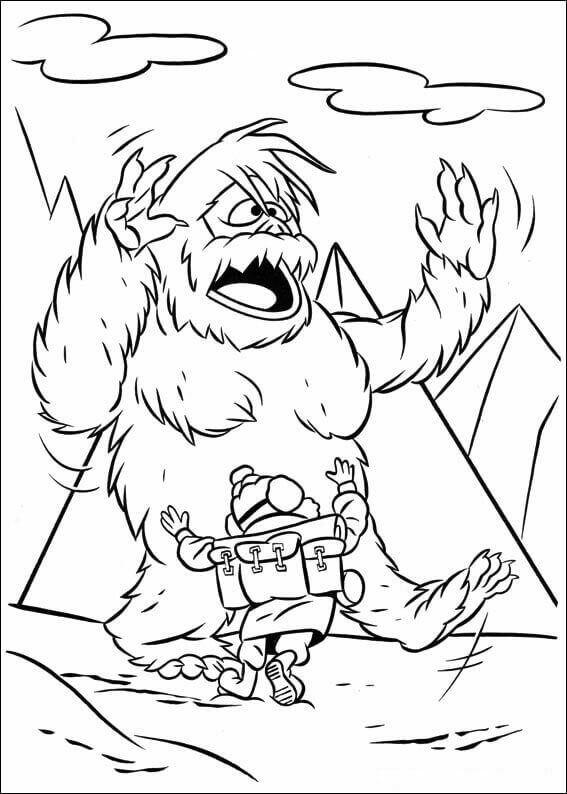 Colour this page with the realization that being different can actually be good. A magnificent duo of Santa Claus and Rudolph is depicted in this picture. Looks like they are delivering gifts to your house. Did you ask for an airplane? Or was it a doll? Never mind, he has got you both. And the leader of the reindeer tribe is ensuring that there is no difficulty in the delivery. Let us enjoy coloring this page. Looks like Rudolph and one of Santa Claus’ elves are discussing something regarding gift delivery. Perhaps the route of delivery? Or a number of gifts to be produced? Or maybe the elf is taking advice regarding the type of gifts to be produced. Let us help them by penning down our suggestions on a piece of paper. But first color this page. Want to make your parents proud? Well then follow your dreams! Be good at what you do and pursue your passion. They will be happy. Colour this picture after deciding to make your parents proud. 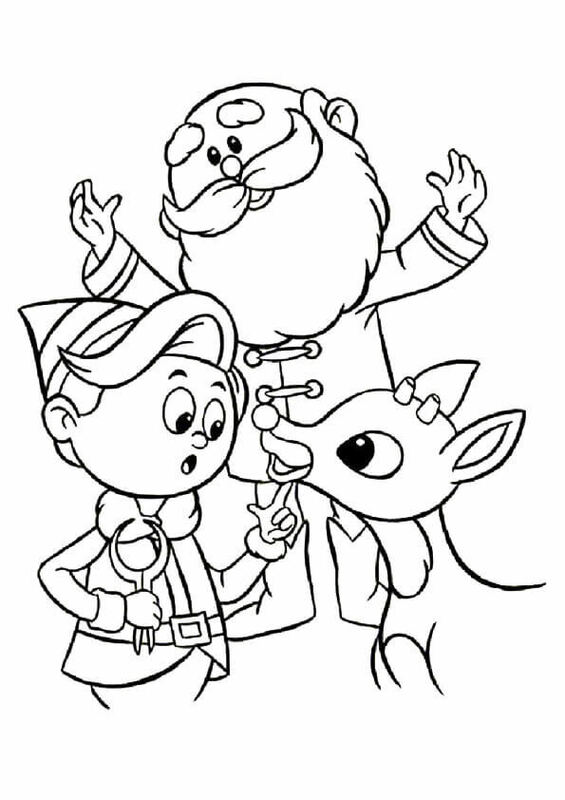 This trio of Santa Claus, Hermey the elf and Rudolph, the red-nosed reindeer is legendary. They all three are representatives of unwavering courage, self-belief, confidence, and happiness. They believe in spreading love and happiness and they reiterate the faith in following one’s dreams. Let us color them with joy. Christmas is coming soon. Time to clean those chimneys. Remember it is a night of gifts and Santa travels through chimneys. I would suggest you decorate the Christmas tree well. Don’t forget to keep some treats and Christmas delights out for Santa too. He has worked the whole year round to make the perfect gift for you. We can at least treat him on Christmas night. By the way, you can always look up to the sky and spot him high in the air, spreading happiness. 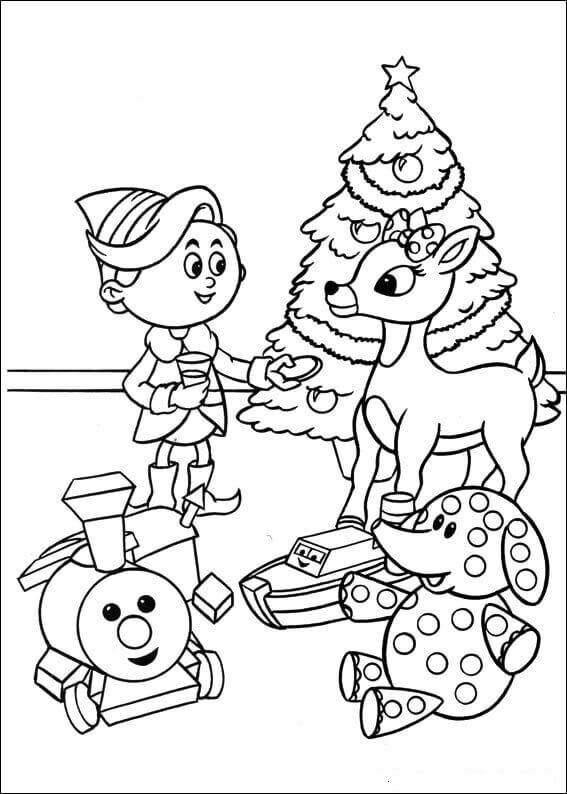 Let us color this page filled with excitement for Christmas. Same, the snowman is the narrator of Rudolph’s story in the Rankin-Bass movie publication. He is a snowman look-alike of Papa Jones. Donning a black hat, a green waistcoat with a green umbrella and a pocket watch, he looks like a 90’s gentleman. He has a trademark beard and grin. The voice keeps the viewer engrossed, interested and engaged throughout the film. Throw in some green and white and black with a hint of silver, to give authenticity to this image. The leader of Santa’s freight, Rudolph and him are having a delightful conversation. They are discussing who has been a good kid during the year and who actually deserves the presents. Perhaps we can help them. Let us paint them well to show off your skills and all the practice you have had to date. You might just get lucky. 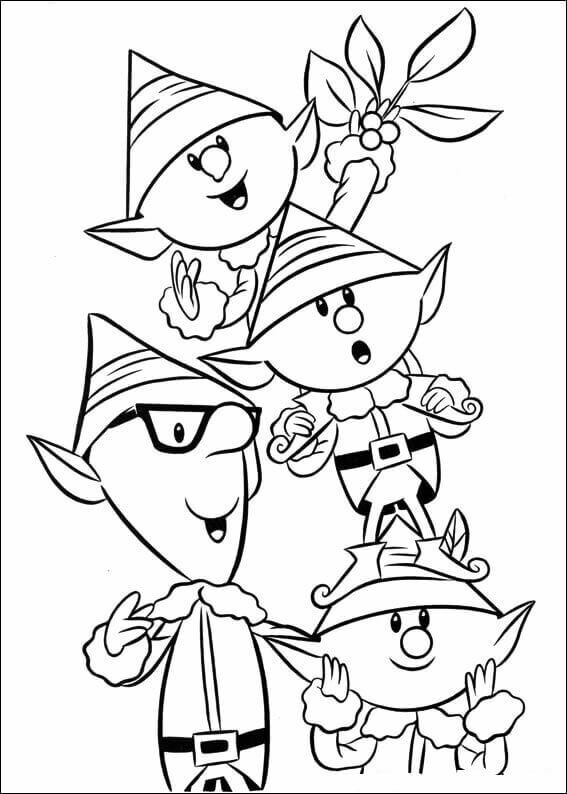 Elves are miracle workers. They don’t get tired easily. They can work relentlessly. And they enjoy their work. They take it as their responsibility to create wonderful toys to keep children like you happy. They never complain about having to work late hours, because they love the smile it brings to your face. Let us color them well. Rudolph is a happy creature. What I need you to do now is to see his movies and listen to his songs. 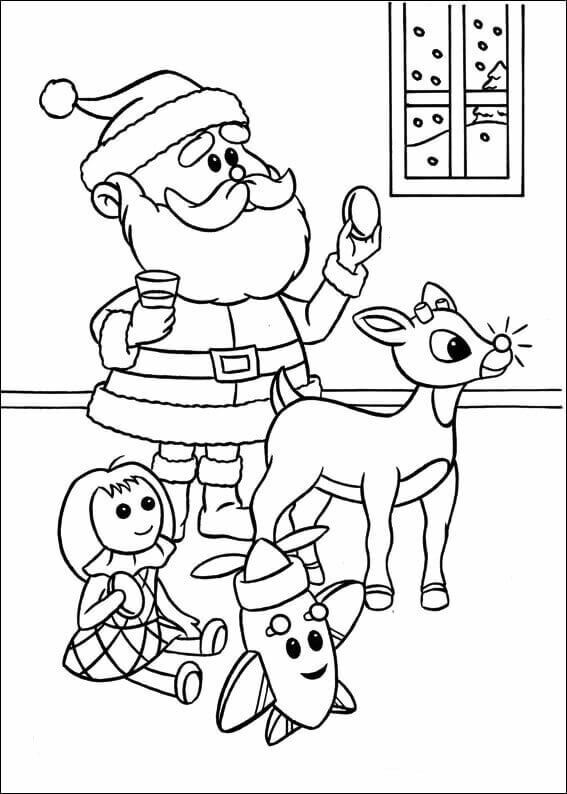 But don’t forget to color these Rudolph the Red Nosed Reindeer coloring sheets as well.